According to the most recent figures, Norway is currently leading the way in EV ownership in Europe. In fact, plug-in electric vehicles accounted for more than 33% of new car registrations last year and Norway also has the largest share of full electric vehicles in the world. 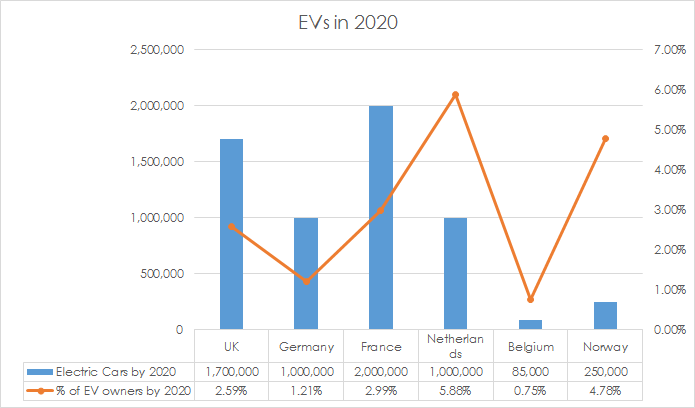 Other countries, such as France and Germany, have set targets to reach similar levels of EV adoption. But how did Norway become such a world leader in electric cars and will the rest of Europe catch up? The Norwegian commitment to green cars started back in the 1980s when the country used its most famous pop group – A-ha – to begin promoting EVs. By the mid 1990s, Norwegian EV producer PIVCO had successfully run 10 EVs during the Lillehammer Winter Olympics and awareness of electric and hybrid vehicles in Norway was beginning to grow significantly. At that point the Norwegian government began making it easier and more attractive for Norwegians to own and run their own electric car. For example, electric cars are exempt from the annual road tax, all public parking fees and toll payments and also have the added bonus of being able to use bus lanes. These incentives were put into effect until the end of 2017 or until the 50,000 EV target was achieved - and sales of electric cars smashed these targets in 2015 as demand soared. Charging points became a focus as the popularity of electric vehicles began to rise. Oslo launched its first municipal EV charging infrastructure program in 2008, making it one of the first cities in the world to do so and putting Norway far ahead of its European neighbours in terms of EV-supporting infrastructure. Norway does have some counterparts when it comes to countries looking to be equally forward-thinking in terms of electric vehicles. The UK, for example, aims to have 1,700,000 electric vehicles on the roads by 2020, which will be 5% of all UK cars. The Netherlands is aiming for a figure of 1,000,000 by 2025. Many countries are making commitments to reducing emissions – in fact, the Netherlands is one country that has expressed an aim to ban the internal combustion engine in 10 to 15 years time. Of course, there are also countries in Europe that aren’t doing quite as well when it comes to adopting EVs and setting up the requisite infrastructure. In Estonia, for example, the plug-in market had only a 0.2% share of new car sales in 2017 and in Denmark the figure was 0.4%. This is very low compared to EV leader Norway, where the figure was 33% in 2017. Norway recognised early, that a strong charging infrastructure would hold the key to enabling EVs to be widely bought and used by Norwegian consumers. Other countries are also investing heavily in charging infrastructure, such as the UK which established the Electric Vehicle Homecharge Scheme and the Plugged-in Places Program to help develop local charging infrastructure. France has invested 50 million euros in financing charging points as well as driving the development of charging infrastructure through a series of public private partnerships. The Netherlands now has an average of 1.1 charging stations for every 1,000 registered vehicles, with Germany having 0.19 stations for the same number. Both countries have relied heavily on public-private partnerships (PPP) to help establish a denser and more extensive local charging infrastructure. As we learn more of the facts about electric cars and the benefits of moving on from the bus lanecombustion engine, there is increasing enthusiasm for switching to EVs across Europe. Plus, the list of electric cars available to buy grows by the year with manufacturers now producing everything, from efficient city EVs to electric sports cars. With increasing consumer knowledge around upcoming electric cars and around how to charge them, it is likely to be much easier for other European countries to catch up with Norway. Essentially, effective promotion of the benefits of driving electric cars will determine which other European countries successfully catch up with Norway’s EV achievements. Investment in charging infrastructure in major cities – as the Norwegians did in Oslo – may be costly but will also create cleaner urban environments and enable more people to buy EV cars. Governments may need to offer more in the way of incentives – as the Norwegians did by exempting electric vehicles from road tolls and reducing tax – as this will help to drive consumer EV purchasing and reduce impact on the environment. There is every opportunity for other European countries to catch up with Norway when it comes to EV ownership and use. Given the increase in incentives for driving EVs, the growing accessibility to charging infrastructures and an incline in demand for electric vehicles, we could even see another EU nation on top of the electric vehicle list as soon as next year.